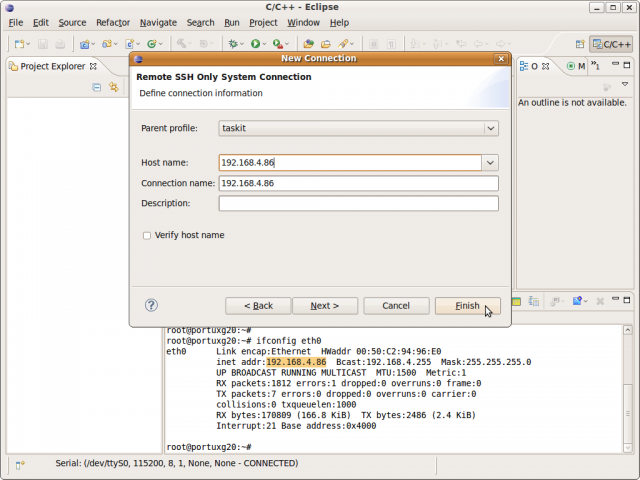 At first, you have to set up the serial connection so that you can get access to serial console of the device. 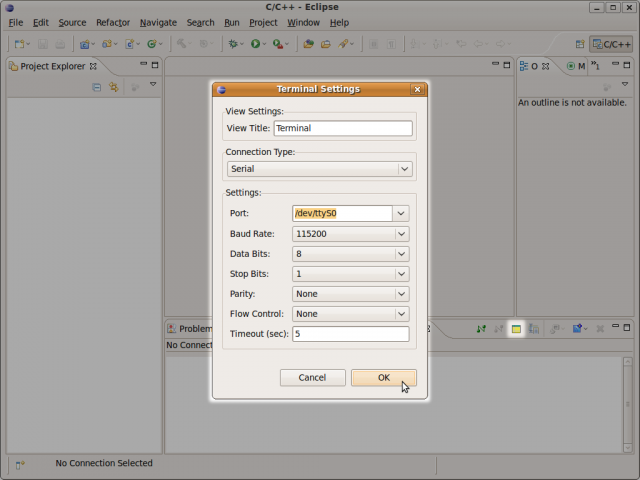 For that, add a new terminal view to Eclipse under the Menu Window -> Show View -> Other. After that, change the settings according to the next screenshot. Change port according to your setup, e.g. /dev/ttyUSB0 if you use a USB-to-serial-converter. 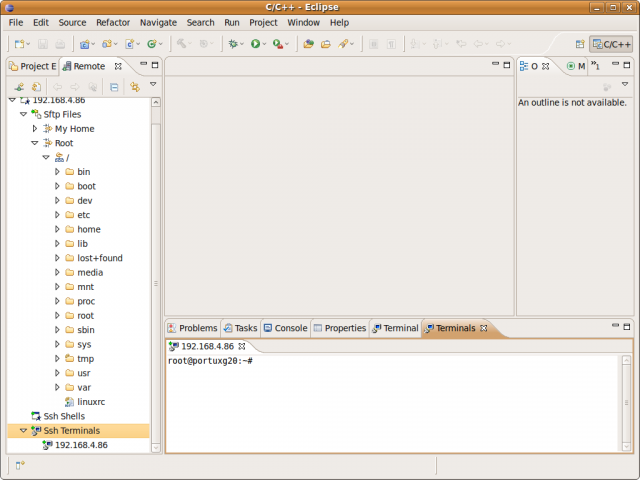 The terminal is now automatically connected and can be used. Use the red and green icons to disconnect and reconnect respectively. 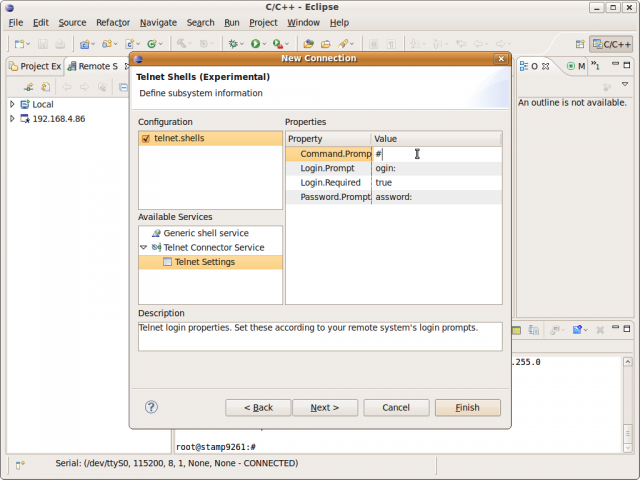 For the remote debugging feature to work, you have to set up either a Telnet or an SSH connection. Which you choose depends on what is installed on your target device. We start with an SSH connection. 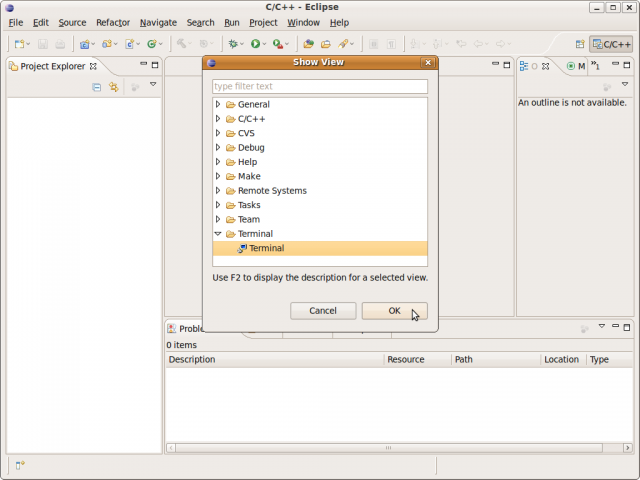 Choose menu File -> New -> Other. Choose "SSH only" in the next dialog. After that enter the connection details. You can now get an overview of your remote connection by adding the view "Remote Systems". 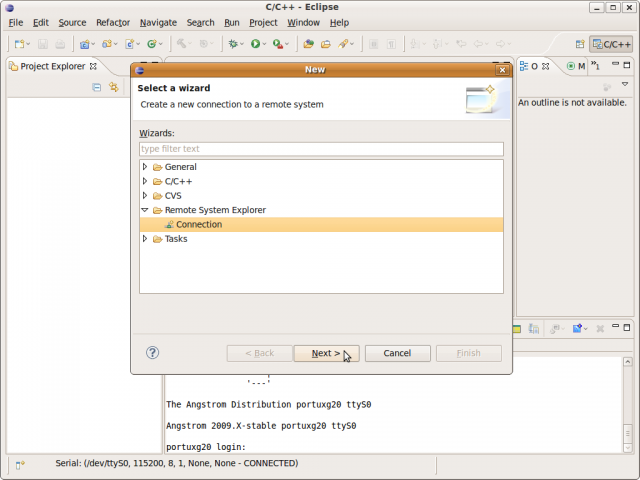 Select the connection you just added, open the context menu and choose connect. If you have used SSH for the first time, you will have to answer some questions - accept everything. After that, your are asked for the credentials. If you have not changed anything, the username should be "root" and the password "taskit". and this function will work. Setting up a Telnet connection is basically the same as an SSH connection. You just have to select "Telnet only" when you are asked for the connection and after entering the hostname/IP-address, you don't click "Finish" but "Next" to do some further adjustments. Depending on the product you use, change "Command.Prompt" to "#" (the default is "$"). Check the prompt on the serial, telnet or ssh console, before making this setting. After that click "Finish". The Telnet connection is now set up and you can launch terminals like with the SSH connection.